Mole is always one of those dishes I’ve always wanted to really love, but it’s so heavy for me. So when I found this green mole recipe, vibrant with cilantro and deeply flavored enough to be called mole, I knew I had to try it. I just so happen to be sitting in jury duty selection (civic duty, check. Please don’t call me for ten more years), so what’s the verdict? Guilty, your honor. Guilty of being delicious, and really quite simple. Guilty of being rich, yet bright; vibrant, not heavy. Guilty on all charges. If all attempted robbery cases were as simple as this Zacatecas-style recipe. I was surprised by the directions to boil the chicken, but the reviews convinced me to try it. 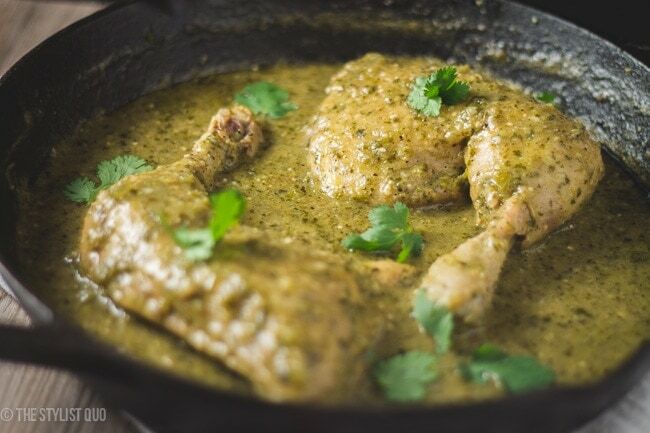 I’m glad I did–the chicken was so tender and full of flavor, the perfect base to be completely smothered in the garlicky tomatillo sauce. The flavors are similar to a salsa verde, but the tomatillos are almost caramelized by being cooked down into a paste. This recipe isn’t necessarily fast, but there’s not much active work involved. It’s so worth it, though. Try serving with a bit of rice and some tortillas for cushioning the flavorful chicken and sauce. Oh, and take pictures. It’s green as hell. Make this. 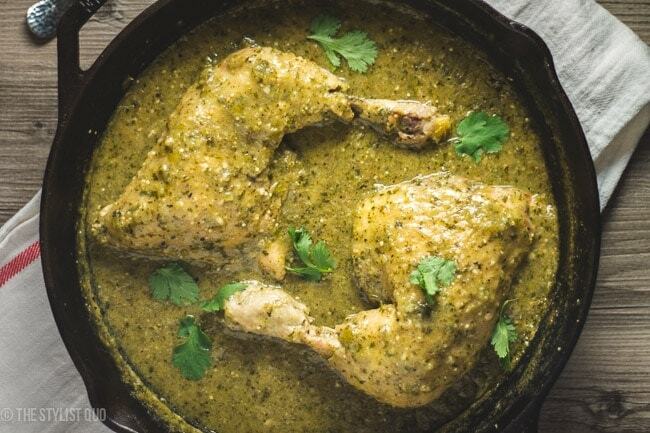 A bright, brilliantly flavorful green mole, chock full of garlic, cilantro, and tomatillos, with perfectly flavored and tender chicken. 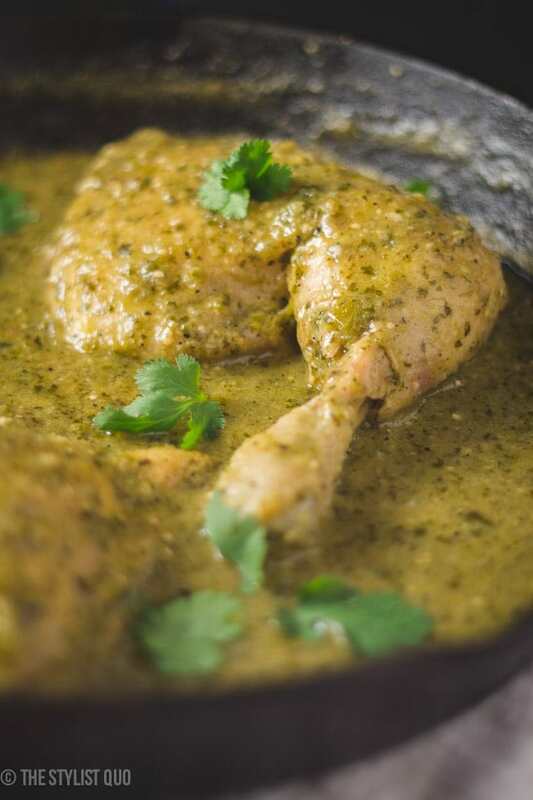 Cook the chicken: Place chicken, cilantro, salt, peppercorns, garlic, onion, bay leaf, and 12 cups water in a 6-qt. saucepan and bring to a boil; reduce heat to medium-low and cook, covered and stirring occasionally, until chicken is tender, about 30 minutes. Remove chicken from saucepan and strain liquid through a fine strainer; reserve 4 cups, and save remaining liquid for another use. Set chicken and liquid aside. Heat tomatillos and jalapeños in a 4-qt. saucepan over medium heat and cook, stirring occasionally, until darkened and thick, about 10 minutes. Transfer to a blender with cilantro, salt, garlic, tortillas, and 1 cup reserved cooking liquid; puree. Heat oil in a 6-qt. saucepan over medium-high heat; add tomatillo sauce and fry, stirring constantly, until it thickens into a paste, about 5 minutes. Whisk in remaining cooking liquid and bring to a boil; reduce heat to medium-low and cook, stirring, until reduced and thickened, about 30 minutes. Add chicken pieces and cook until heated through, about 10 minutes. Serve with Mexican rice and tortillas. I’d never boil chicken. Never. 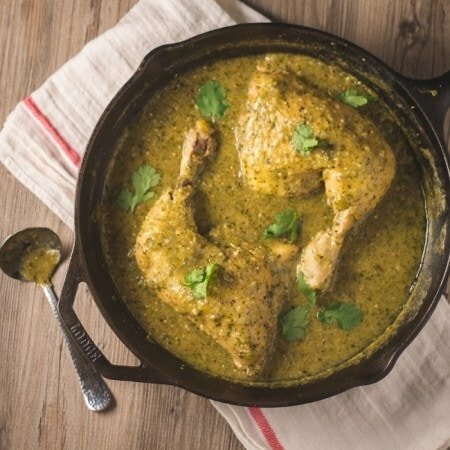 Green chile loves being paired with roasted chicken. Quail, even better. I think you’d be pleasantly surprised! This is an awesome recipe. I have never heard of mole verde before. The colour and flavour sounds so nice. Just tweeted about this. Yum! Thanks Purabi! It’s really so good. I actually had a green mole turkey enchilada at this Mayan restaurant in Playa del Carmen, Mexico, and it was very similar now that I think about it! Red mole can be soooo heavy and almost chalky with all the blended in raisins, dried chiles, nuts, and chocolate! While I love a good rich red mole, this is so easy to put together, and quite refreshing for a more “all-the-time” dish! Isn’t this more a “salsa verde” rather than a “mole”? It looks delish but mole (no matter the color) is much more involved! It’s a Zacatecas-style mole; they vary by region. It’s much less involved than a nuts-and-chiles-style mole, that’s for sure! But I found it to be beautifully rich from the caramelization of the tomatillos. Do you think this could be cooked in a tagine? Hmm.. I’m honestly not sure. I’ve never really cooked with tagines, but I would imagine you could immerse the chicken in the completed mole sauce and cook it from there in the tagine! This chicken looks beautiful. I love boiling chicken. I know that sounds weird, but I almost always boil chicken if I’m going to make a chicken salad or something because I think it makes a nice moist chicken. Anyway, I love cilantro so much. This recipe would be such a treat for me. I can’t wait to get home and give it a try!